The home is the most precious sanctuary for the family. After another busy day starts winding down toward bedtime, there's no better way to decompress and relax than enjoying a movie or TV show with the people we love most. These special moments are what give TV stands their unique importance - and this impressive 63" solid wood stand is one of the best on the market. 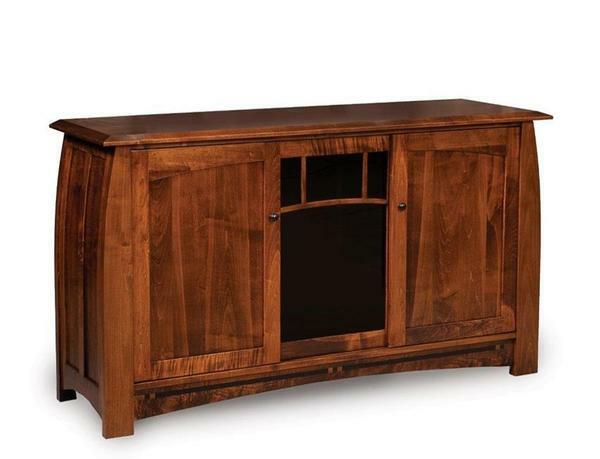 The Boulder Creek TV stand offers enough heirloom durability and traditional beauty to last through years and years of daily use without ever looking dated. The smoked glass door in front allows remote access to DVD players, games consoles and more while keeping them safe and protected from dust, pets, and curious little fingers, while the spacious media storage shelves on either side offer ample space for growing libraries of DVDs, box sets, and games. Every element of this elegant TV stand is handcrafted right here in the USA by our dedicated Amish woodworkers, promising you nothing but the best in home-grown quality and attention to detail. If you've any questions at all about this piece, please don't hesitate to get in touch by phone or by email - we would love to hear from you. Shown in Brown Maple with Asbury Brown.